Eating has reached really needy levels, Chez Crumb. The rain won't stop, and even if it does stop for a few hours, it's still cold and gray. Windy, too. Not what you'd call cheery winter weather. I don't think winter weather is ever cheery in Northern California, because it's always raining. And it's supposed to be spring! 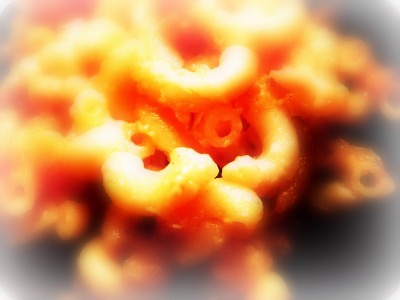 I had been toying with the idea of topping the mac'n'chee with crushed Cheetos. All that color, crunch and weird flavor! But in the end, mood maintenance took priority over wacky, retro tinkering. I mean, would you have eaten that? It would have been difficult. My homemade macaroni and cheese tip for the day: Stir a little cream cheese into the bechamel along with the orange cheddar. It's... creamy! LOTSA TREES DOWN AROUND HERE, AND I HAVE TO LEARN THE WORD BECQUEREL? You are telling the world my secret for creamy cheese sauce, It's all in the cream cheese. I made a glorious Belgian pot roast - sauteed the beef chunks and then added beer and brown sugar, turnips, onions, etc. The house smells divine and the beer with dinner helped chase the rainy blahs away. Hi, Nancy: Yeah, isn't that a great trick? I was tickled to hear you do it too. This was my first time. So! Can you beat pot roast? Belgian, at that, which I assume means "with beer." Too good. This is definitely comfort food weather. And no end in sight. *sigh* I'll remember your tip about the cream cheese. Thanks. Zoomie: Looks like you're doing the comforty stuff, too. Sigh. I think we're going to get hammered again tonight. But at the moment, there is a ray of gleam outside my window. Wouldn't exactly call it "light." Australian Cheddar is yellow, not orange, so I don't think it would be the same. I don't even know if we can get the boxed stuff! Ha! I made mac & cheese last night too for the same reasons. I used a mild cheddar that had some garlic spiked into it and plenty o'butter & milk. I prefer my mac & cheese un-baked (just incorporated in the pot). Did you bake yours? Mouse: We're supposed to call it yellow too. But some of that stuff is dang neon. You can't get the box? They're big in Canadia! I love your idea of the cauliflower, because cauliflower loves cheese. BACON? Those blue boxes of Kraft steered me on a highway to food life. You think mac and cheese will pull me out of my rain induced funk? I'll give it a try. Rain rain go away! Enough already. Greg: It might work. Depends on your own, private thumb-sucking, rocking back and forth in the crib, desires. Maybe soup would work for you. But hellz yeah, try some mac! Sun comes back tomorrow. THEY SAY. Nancy: That strikes me as smart cooking. THANKS for the recipe.